So, what’s wrong with this picture? Oh, let me count the ways. Langan’s model and assumptions are similarly flawed as those I saw back in 1998–1999 during the dotcom bubble. Projections like Langan’s are a spreadsheet exercise where the math is not the problem, but the underlying assumptions actually have little basis in reality. 1. Langan ignores how electric vehicle (EV) owners actually charge their vehicles. Residential: At a single-family home or apartment/condominium complex. Workplace: Especially in markets where EV adoption is high, most office parks and office buildings have installed charging points for employees. Destinations: Hotels, resorts, wineries, ski resorts, theme parks, etc. Local Public Charging: Located at restaurants, shopping malls, and downtown shopping/entertainment area parking lots and garages. Interstate/Intrastate Highways: Currently, the majority of these charging stations — typically located at restaurants, gas stations, food stops, outlet malls, and similar locations — are Tesla Supercharger sites. With the 60 kWh battery Tesla Models S and X, owners of that model have a realistic range of about 205 miles. Owners of the 90 kWh and 100 kWh battery models can expect 275–300 miles of range. The Model 3 has a promised range of 215 miles, but I’ll peg it closer to 205–210 for real-world driving and leaving a few miles to spare. With a range of 200+ to 300 miles (today, and increasing in the coming years), the primary public charging needs of Tesla owners are destinations (long dwell, slow charge) and interstate/intrastate (short dwell, fast charge). Langan’s model simply ignores these realities and instead uses a flawed comparison to gas stations. Gas stations are an old-world concept based on an ecosystem built around the storage and delivery of gas and diesel. It wouldn’t make sense, for example, to have gasoline storage tanks located at millions of homes, office parks, and hotels/resort. As a result, gas and diesel fuel is delivered by truck to gas stations, many of which are located within a few miles of homes and multi-family units. With electric vehicles, however, this highly centralized model of “refueling” stations will increasingly only be critical for long-distance trips. As all homes and businesses are wired for electricity, this fundamentally changes the “refueling” distribution model. EV charging, albeit not necessarily done quickly, is possible wherever there is an electrical outlet. Charging electronic devices such as laptops, smartphones, and tablets is the better analogy for EV charging, instead of comparing to refueling at gas stations. As consumers, we have learned to monitor how much power we have left with these electronic devices and plug in to recharge at home, work, coffee shops, the airport, and, again, wherever there are available plugs. But like these electronic devices, according to a study from the Idaho National Laboratory, the majority of EV owners charge their vehicles primarily at home. 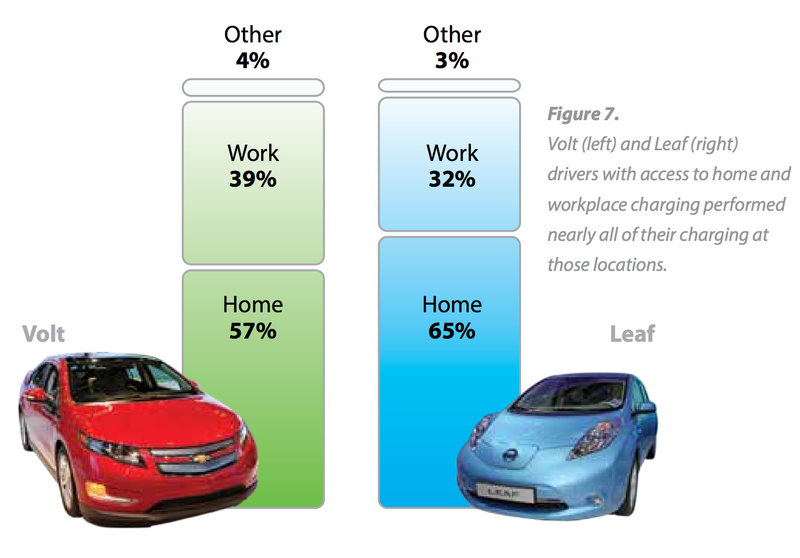 The study also found that EV owners with access to chargers at both home and the workplace performed 98% of their charging events either at home or work and only 2% at other locations. The results don’t change much by type of EV. Equating the need for Tesla Superchargers at the same volume and density to gas stations is simply illogical. 2. Langan downplays the use of home chargers. This is just idiotic, as any EV owner knows. Forgetting to plug in your EV, especially if range is low, is just something that EV drivers don’t do. Charging becomes second nature just like, oh, dare I say, remembering to fill your gas tank. And if the power goes out, that nearby charging station that Langan calls for will likely also be without power too. D’oh. There are approximately 75 million owner-occupied households in the US, with 80%, or roughly 60 million homes, having a garage or carport. There is an additional approximate 44 million renter-occupied households, 35% or 15 million of which are living in single-family homes. And while a bit dated, a 2013 Edmunds analysis of US Tesla Model S buyers revealed that 77% had an income above $100,000. While I did not find any data to support this, my assumption is that the vast majority of Tesla buyers who own a home have also installed a home charging unit and primarily charge at home. The bigger challenge and unknown, especially as the Model 3 deliveries take off in 2018, is where will a growing number of young, urban Tesla owners who live in apartments and condos charge their cars? For these Tesla owners, I expect most will have access to chargers at their apartment complexes, workplaces, or both. Some of these Tesla owners who live or work near a Supercharger will certainly try to use them as their primary charger. Tesla recognizes this of course and will continue to tweak its Supercharger policies to minimize this type of use. In fact, while it might not be overly popular with some owners, Tesla can reduce overuse at local Superchargers by adjusting pricing policies, as this article on workplace EV charging pricing policies reveals. 3. Langan completely ignores the Tesla Destination Charger network. Globally, Tesla has 4,148 Destination Charger sites and 7,110 connections, according to the company’s Fourth Quarter & Full-Year 2016 Update. That is an average of 1.71 chargers per Destination Charge site. By my manual count on March 3, 2017, from the Tesla Destination Charger webpage, I estimated 696 (+/-) Destination Charger locations in the US. That would equate to 1,190 actual connections. The 4,148 global Destination Charger total was a 120% increase from 1,884 at the end of 2015. If we assume a growth rate of 100% in 2017, there would be roughly 1,400 sites and 2,400 charger connections in the US. Many of the Destination Chargers are located at hotels and resorts, which are a core charging need among EV owners. On a recent weekend, my wife and I drove 3 hours up the California coast and stayed at a resort in a very isolated area. This resort had two Tesla Wall Chargers and an additional Level 2 charger that would connect with an adapter to a Tesla. Upon arrival, we checked into the resort and quickly added a little safety zone of about 35 miles, as we were headed to the next town for a birthday party. That night and the following night, I simply plugged my Tesla into the Tesla Wall Charger and I was good to go for the subsequent days. On our drive back home, I did stop off at the Napa Supercharger just to provide a little buffer. Though, it wasn’t needed, as I would have arrived home with about 25 miles of battery range remaining. My point of the personal anecdote is that my example is typical of real-world charging needs. With the current Tesla 60 kWh battery, owners have a realistic range of about 205 miles. That is enough range to cover the daily roundtrip commutes and chore trips for 99% of Americans. These charging needs can and should be met with charging at home — whether a single-family home, condo/townhouse, or apartment complex. The 200+ mile trips are and will be met by a growing number of both Tesla Destination Chargers and Superchargers. 4. Langan ignores the fast-growing public charging networks. Home charging and Tesla’s network of Superchargers and Destination Charger locations are clearly the most convenient and quickest way to charge a Tesla. But, while Tesla has a proprietary charging connector, Teslas come with adapters for other major charging networks. If you need a charge in the US, there are nearly 41,000 charging outlets and more than 15,400 charging stations, according to the US Department of Energy, Alternative Fuels Data Center. Subtracting the 346 US Supercharger stations and my estimate of roughly 700 Destination Chargers would mean US Tesla owners currently have access to an additional 14,350 or so charging stations. And looking globally, the EV charger market is forecast to grow from more than 1 million units in 2014 to more than 12.7 million units in 2020, according to the EV Charging Infrastructure report by IHS Inc. While these chargers are primarily a mix of Level 1 and Level 2 chargers, the point is there is an increasing number of EV chargers available both in the US and major markets throughout the world. In Langan’s narrow view, however, Tesla pretty much has to build out by itself the Supercharger network to enable owners to charge their cars 24/7 via that means only. This is simply ridiculous and is somewhat akin to arguing that Ford in the 1920s would need to build enough gas stations to fuel all of their cars. The real challenge with making electric vehicle charging as convenient as filling the gas tank is NOT the number of charging stations, but rather the time it takes to charge. I’ve never actually seen a statement from Tesla or Elon Musk that they want “to make recharging as convenient as filling the gas tank.” But regardless of whether that specific goal has been stated or not, I believe the actual long-term priority is making charging nearly as quick as filling the gas tank of a vehicle powered by an internal combustion engine. So, what Langan actually misses in his analysis is the future investment Tesla will need to make in upgrading the Supercharger network to enable a charge time of under 10 minutes. And in December of 2016, Elon Musk hinted via some tweets that Tesla would at some point upgrade Superchargers with greater than 350 kW charging capability. With current Superchargers powered at around 100 kW, Tesla owners can achieve a charge of about 170 miles in around 30 minutes. When these new chargers are rolled out, Tesla would likely achieve a charge of 150–200 miles and meet Straubel’s goal of charging in under 10 minutes. And while one can only guess at the costs for the higher-powered Superchargers and timeframe for the upgrade, Langan seemed to miss one of the most important components of the future investment required to scale the Supercharger network. And he got most everything else wrong too. 6. Tesla needs to add 30,000 new Superchargers. As I’ve outlined above, this is simply hogwash. Tesla clearly does need to expand its network of both Superchargers and Destination Chargers to meet the growing demand from Model S, X, and future Model 3 owners. While not based on any concrete evidence or numbers, I would estimate that Tesla needs to double both the number of Superchargers sites and chargers per location in the next few years. In California, for example, I believe Tesla’s biggest need is not so much more Supercharger sites, but more chargers per location. In most of the popular long-distance routes, such as along Interstate 5, there are now Superchargers located frequently enough to handle a 200-mile range. But on holidays and high-traffic times, there can be backups as owners wait for fellow drivers to complete their 30–60 minute charges. There is currently an average 6.4 connections per each Supercharger site. I would expect to see Tesla doubling that average as part of the announced expansion. And when combined with Musk’s hints at super-fast chargers at greater than 350 kW, access and wait times should be sufficient in most regions. That would get us to an investment in 2017 of approximately $88 million, or $264 million over a 3-year period. That is nowhere near the $2 billion to $8 billion in the US alone that analyst Langan is suggesting. I’m sure my models have some flaws as well, but I just don’t see any basis for the magnitude of his numbers. And, fundamentally, Langan’s numbers are simply based on a ludicrous comparison to the reach and proximity of gas stations.